A luxury villa will be the latest jewel in Leonardo’s crown, until he discovers Veronica stands to inherit it. Their chemistry is spectacular…but so are the consequences when Veronica reveals she’s pregnant! Isabella is on a deadline. She has twenty-four hours to wed or she’ll lose her inheritance! Andrea knows she can’t refuse his proposition for a temporary union. But can Izzy risk surrendering to temptation? Poised to bring the Perez name into disrepute, Miranda must be stopped! But when Basilio meets Miranda, he is captivated. His plan becomes one of seduction…that tests his control to the limit! Arturo is furious when Rose places his latest business deal in jeopardy. 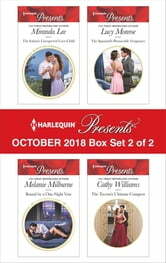 Now his greatest asset will be seduction, leaving Rose so overwhelmed with pleasure that she forgets all about the deal. Until he finds himself equally addicted—to her! 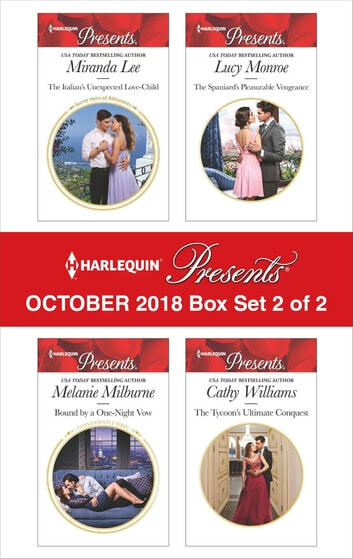 Be sure to collect Harlequin® Presents’ October 2018 Box Set 1 of 2!